Parents: Why your child may not have received a good report this year. For those parents concerned about a lack of progress in their child’s education this year, one reason may be that they not actually being taught by a professional teacher. The Daily Telegraph reveals that many children are being taught by untrained staff – classroom assistants. 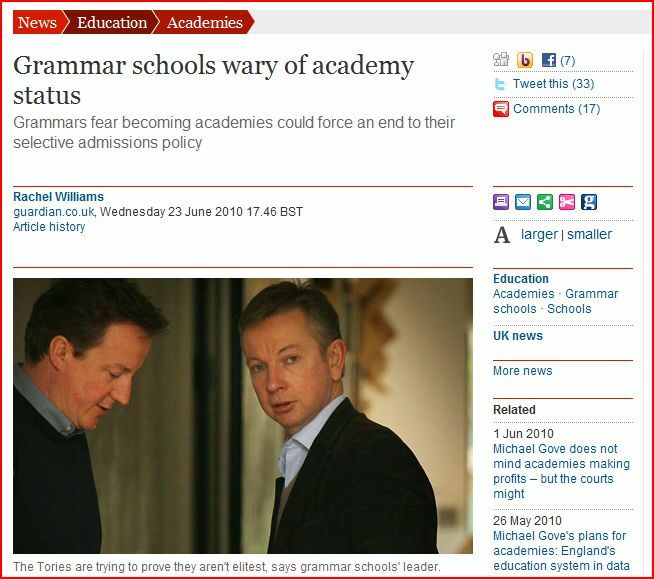 The National Grammar Schools, http://www.ngsa.org.uk have issued an urgent warning about the government’s attempt rush to schools into applying for academy status. 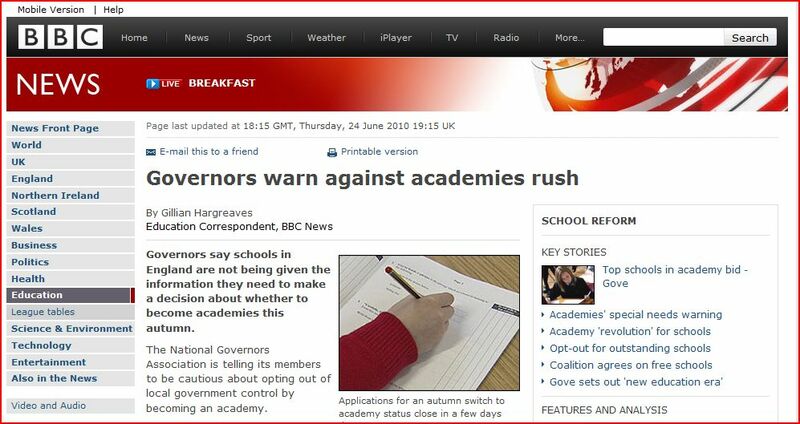 The Press Association picked up on the detail and now the mainstream media have joined in. Parents should contact the NGSA or the Board of Governors of their grammar school rather than depend upon headteachers who may have conflicted interests. The fact that parents have not been provided with a specification for the GL Assessment tests offered by the Post Primary Transfer Consortium is a breech of recognized International Standards on testing. Despite an FOI request for the specification of the GL Assessment tests used by many schools last year made to the PPTC no specification has yet been provided. GL Assessment claim that a specification was agreed with PPTC. 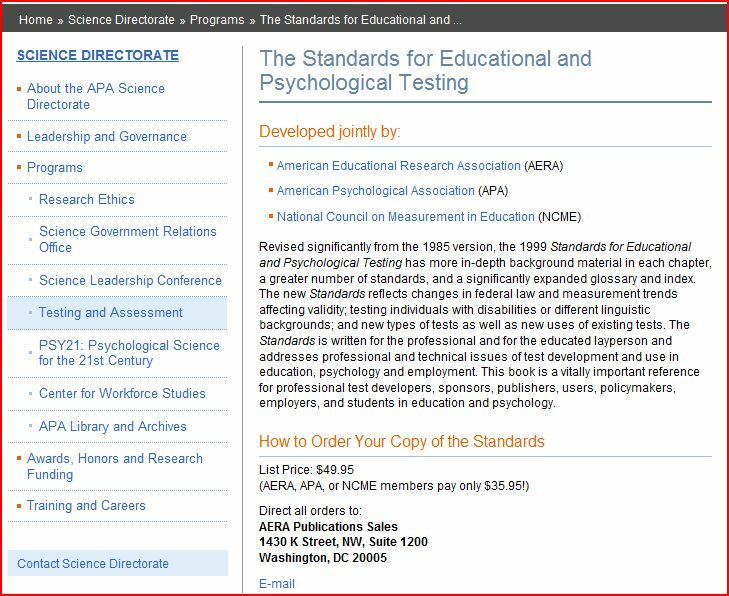 Section 5:10 of the American Psychological Association (APA) standards address specification requirements. Parents were encouraged to enter their children for the Post Primary Transfer Consortium’s GL Assessment Test to facilitate their transfer to grammar school. One of the most prominent inducements was that the tests were claimed to be free in contrast to the AQE (Association of Quality Education) CEA (Common Entrance Assessment) charge of £35. The broadcast and print media made much of this distinction although not one correspondent produced any investigative findings to explain how GL Assessment were to be paid for their activities. Figures provided in a delayed answer to a Freedom of Information request to Ballymena Academy reveal that a sum close to a quarter of a million pounds may have been paid by participating schools. The source of the funds used by Ballymena Academy is not disclosed but averages over £28 per pupil. Instead of one agreed common assessment test for grammar schools it appears that unidentified leaders from the PPTC wanted to make a distinction over £7. Unsuprisingly talks aimed at agreeing a common test have failed. Parents of Ballymena Academy will no doubt be asking themselves why they are expected to fund applications from parents from various primary schools many of whom do not end up attending the school. There is no free school lunch from the PPTC. This is the undated, unattributed, incomplete and tardy response received from the Headmaster of Ballymena Academy Grammar School, Ronnie Hazzard in response to an FOIA request sent by the Parental Alliance for Choice in Education in March 2010. The postmark on the letter was 4th June, 2010. Ballymena Academy joins a growing list of grammar schools appearing to think that the law on providing information, as a public authority, does not apply to them. Mr Hazzard’s personal assistant first claimed that the request had not been received when contacted after the 20 working day deadline had passed. An immediate e-mail with the original request date-stamped instantly disavowed the claim. 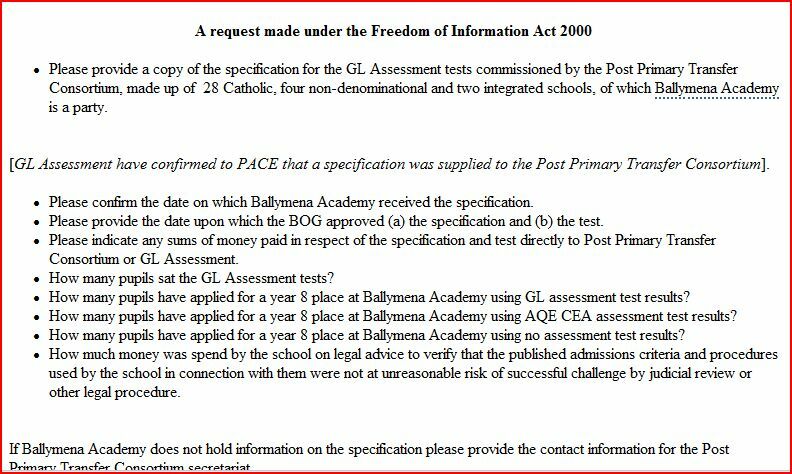 Read the request here and note carefully how Ballymena Academy totally ignored the first question and also subtly reworded questions posed. No doubt the Information Commissioner’s Office will have something to say on the matter. The General Teaching Council to go. 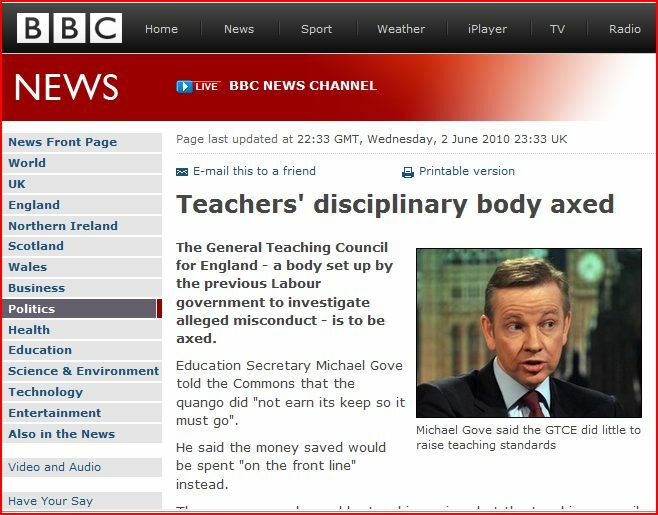 Michael Gove has decided to remove the General Teaching Council of England and use the resources on frontline education services. Unfortunately Northern Ireland will not benefit from the same “quango cull” approach. The Northern Ireland General Teaching Council suffers from the same bloat but will undoubtedly survive and prosper while schools and learning are subject to Northern Ireland Minister of Education, Caitriona Ruane’s indiscriminate acts. Parents should visit the GTCNI website and ask themselves if a body without current regulatory powers is worth any more than the ESA which has cost taxpayers millions without actually coming into being. Chris Keates, general secretary of the NASUWT teaching union, said she had “no doubt” Mr Gove’s decision would be welcomed by teachers. “I have frequently said that if the GTCE was abolished tomorrow, few would notice and even less would care,” she said. The selection of pupils for admission to a post-primary school is a matter for the Board of Governors of the school. Some parents/guardians may be disappointed that their child has not been accepted by a school of their preference and may wish to appeal the decision of the Board of Governors. You will have been advised of your right to appeal against Boards of Governors’ decisions at the time of notification of school placement. If you wish to appeal the decision of a Board of Governors’ in not accepting your child, you should notify in writingthe ELB in whose area the school you wish to appeal against is situated, by Wednesday, 9 June 2010 by 4.00pm. If your letter indicating your intention to appeal is not received by this date and time it will not be processed. An Appeal Form and details of the Appeals Procedure will be issued to you on receipt of your written intention to appeal. Appeal letters received after this date will not be accepted. An Appeal Tribunal considers the evidence that was available to the Board of Governors of a school at the time it was making its decisions on admissions to the school.Recorded delivery is recommended. An Appeal can only be upheld if a Tribunal finds that the admissions criteria were not applied or not correctly applied and that if the admissions criteria had been correctly applied by the school, the child would have been admitted to the school within the admissions number for the school.If an Appeal Tribunal should find that a Board of Governors did not apply its admissions criteria correctly, and that the child would have been admitted if it had, the Tribunal will award that child a place at the school concerned.